Posted on January 8, 2015 by thelostlighthouse	in Comics, Literature and tagged all-ages comics, Archaia, Boom! studios, comics, comics reviews, Feathers, Jen Hickman, Jorge Corona, Literature, The Lost Lighthouse, TLL. This week I caught up on all the comics I missed out on over the holidays, as I spent a lot of it up in the frozen northern countryside, so it was a pretty expensive trip to the comic book shop. I decided to pick up Feathers #1, the start of an new all-ages mini series from the Archaia imprint at Boom! Studios. It was written and illustrated by Jorge Corona, with colours from Jen Hickman and letters by Deron Bennett. Feathers opens with a bearded man, Gabriel, wandering at twilight around ‘The Maze’ – the slums of a great nearby city. Two unseen and mysterious narrators discuss the nights events, as Gabriel follows wailing sounds to discover a crying baby covered in feathers. Fearing for the safety of himself and the child, he steals into the night, avoiding the gaze of some other children and a whistling creepy child-catcher. 11 years later, and feathered infant is now a young boy named Poe. Keeping hidden in the rooftops, Poe and his adoptive father Gabriel scurry around the Maze at night. Meanwhile, inside the city, an intrepid young noble girl called Bianca longs for the adventure beyond it’s limits. Her father agrees to take her out, an opportunity she quickly uses to escape and before long finds the adventure she was looking when she bumps into Poe. Corona does a great job with Feathers, especially considering he is both writing and drawing the book. The story is simple but engaging, with real potential for development of strong themes like acceptance and class deprivation, which is really nice to see in an all-ages book. It has a dark and ominous tone, without being too scary or oppressing, and Poe, Bianca and Gabriel are all very likeable characters. There is clearly some deeper mystery afoot with the child-catcher, and with the two mysterious narrators too. The art is clear and expressive, with bold line work that makes the crooked buildings and character faces really stand out. The colours from Hickman contrast the bright, lush city during the daytime, and the dark, dank night time streets of the Maze, accentuating the art work well. Feathers #1 is a nice, dark all-ages comic that is well-worth picking up either for yourself, or to get any potential new young comics fans into the fold. Check it out at your local comic book shop, or digital comics platform now! Posted on November 13, 2014 by thelostlighthouse	in Comics, Literature and tagged Ariela Kristantina, Boom! studios, comics, comics reviews, conspiracy theories, Deep State, horror, Justin Jordan, Literature, lunar landing, Sci-Fi, space race, The Lost Lighthouse, TLL. This was a big week for comics, for the first time in a long while I actually picked up nearly as many Marvel books as DC, but in the end I decided to pick Deep State #1 to review. The series is published by Boom! Studios written by Justin Jordan, illustrated by Ariela Kristantina, with colours by Ben Wilsonham and letters Ed Dukeshire. Deep State involves conspiracy theories and the agents who work to keep the world thinking they are just that. Agent Harrow recruits Agent Branch at the beginning of the story to his shadowy and unknown organisation, a group who investigate the strange and the unbelievable to keep them a secret from the public. Harrow tells her about the truth behind the lunar landing – not that it never happened, but that it wasn’t the first time. The USSR made it there 5 years before, and they found something alive up there… but never made it back. The Americans investigated and dealt with the problem in 1969, before transmitting the famous small step and giant leap, hiding the other events from the rest of the world. However, secrets don’t have a habit of staying hidden, and the Russian capsule has made it back to Earth. Harrow and Branch investigate the crash site, but find that whatever was inside altered the craft and before breaking out. They now have to track it down before it gets to the nearest town, and do whatever it is the organisation does to keep it all under wraps. Jordan starts a great new story here, with a mysterious Men in Black-style organisation (but serious) and genuine intrigue behind this first issue. I loved the idea that of course the lunar landing wasn’t the first, why would they televise it if they weren’t already sure they could do it? Good conspiracy theories are always the ones that are just about plausible. The two main characters are interesting in their own way, with Branch being headstrong and uncompromising even though at this stage she is the lens that the reader is experiencing this new world, and Harrow being a total enigma at this point. There isn’t much more character development past that in this first issue, but setting up the premise is more important and I assume we will get to know these two more over the next few instalments. The art from Ariela Kristantina is very impressive, looking scratchy and oppressive that really ups the horror angle of the story, especially on that last page (which reminded me a little of Vasta Nerada). This was a strong first issue, and I can’t wait to find out more. I hope we get more information about other popular conspiracy theories and the “truths” behind them that Harrow and his organisation have covered up. The series has a sort of X-Files vibe minus the skepticism. Get on board with this first issue at your LCS or digitally. Posted on October 23, 2014 by thelostlighthouse	in Comics, Literature and tagged Boom! studios, comic books, comics, comics reviews, Eryk Donovan, Good Times Sloth, horror, James Tynion IV, Literature, meme, Memetic, social media, The Lost Lighthouse, TLL. This week, along with a pretty hefty stack of all the ongoing series I’m following, I picked up Memetic #1 from Boom! Studios. This was the first issue of a three part mini series written by James Tynion IV and illustrated by Eryk Donovan, with colours by Adam Guzowski and letters from Steve Wands. Memetic involves an internet meme. Not just any meme though; a weaponised meme that threatens to destroy civilisation and bring about the apocalypse. Following an argument with his boyfriend, Aaron finds himself scrolling through Reddit in his room rather than going to sleep, despite still being awake after 7am. 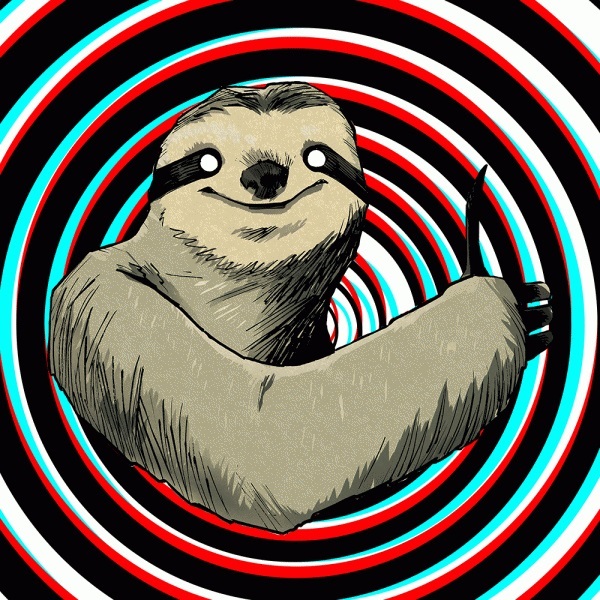 Before finally turning in for a few hours, he comes across a picture of a sloth, smiling and giving a thumbs up surrounded by trippy circles and colours. The post author insists that the image makes them “feel amazing”. Aaron remains unaffected, due to an inability to distinguish colour (other than blue), but throughout the day all of his friends, and soon the entire world becomes infatuated with the ‘Good Times Sloth’, with everyone reporting euphoria and a general feeling of happiness to the point where many can’t look away. Only those who can’t see the picture, like Marcus, the blind former head of US Military Intelligence, or unique cases like Aaron aren’t infatuated. The obsession tips Marcus off to research he remembered reading in his old job, as people start weeping with joy when they look at the image. Getting in touch with Barbara, the author of the paper and an old colleague, they talk about the potential of weaponised memetics, utilising the human propensity to disseminate information and the modern tendency to spread “discord and inanity” over the internet. While they don’t understand what Good Times Sloth is they know it isn’t good, and they’re right. Twelve hours after the post first went live, after the image has been shared ad nauseam over every social media platform there is and all over the news, things start to go very wrong starting with the first people who viewed it. Hundreds of millions of people worldwide had already seen the image, and they all start to succumb to it’s effects. By the end of the first day things look dire, with only those who are unaffected, or who didn’t or couldn’t see Good Times Sloth left to figure out what has happened, how the meme is doing this and who unleashed it. Tynion weaves a very interesting mystery here, and the cast of characters are all well rounded even if some of them don’t stick around for the whole issue. Considering my generally high level of disdain for social media, the story appealed to me a great deal. It is basically what would happen if everyone who shared that tedious viral video of the dancing pony advert for 3 (i.e. EVERYONE) started going crazy. The pervasive and terrifyingly quick rate that the meme is spread and the analysis of memes and social media in general was fascinating, and a great trigger for the end of the world as we know it. I also very much enjoyed the few nods to Tynion’s other series, the twitter handle @doctorrobot, and Aaron’s Facebook page having Karen as a friend, both from The Woods. I found that the use of tweets and messages over the pages worked very well in the context of the story too, which could have easily been annoying (and has been in other comics). The art was strong too, with the whole first half of the issue feeling very creepy, then when all hell breaks loose the colours become much more vibrant and the line work more strained to convey the gravity of the situation. This was a really strong start for this short mini series. I loved the concept, and the execution was spot on too. Pick this up at your LCS or digitally (before the internet is shut down and society falls apart!). Posted on May 8, 2014 by thelostlighthouse	in Comics, Literature and tagged Boom! studios, comics, comics reviews, horror, James Tynion IV, Literature, The Woods, TLL. I’ve been gradually trying to pick up more creator-owned titles as they tend to have more original and interesting stories than the usual superhero comics I pick up (which doesn’t mean I’m getting sick of superheroes, it just means I’m cutting down on food to afford more comics). The Woods wasn’t really on my radar until I saw Scott Snyder tweet about it (odd considering I’ve chosen it over his latest issue of The Wake as my favourite comic this week). It is a new creator-owned title written by James Tynion IV, with art by Michael Dialynas, colours from Josan Gonzalez and letters by Ed Dukeshire, published by Boom! Studios. The Woods takes place in a seemingly innocuous American high school in Milwaukee, allowing us a brief but effective introduction to our key players in the story in the form of tiny captions that tells us all we really need to know about them. Suddenly a flash of light transports the entire school to a world drenched in an oppressive darkness, surrounded by a thick wooded area and populated by various frightening beasts that begin to terrorise the unsuspecting students and staff. Everyone panics, most try to hole up inside the school, but a rag tag group decide that the only way to survive their predicament is to head into the woods to look for answers as to what happened to them and why they are there. All I’ve read from James Tynion IV so far has been his work on Talon, the backups in the main Batman series and recently the new weekly series Batman Eternal, all of which I enjoyed. The writing here is really engaging. It is easy to care for all of these characters fairly rapidly, as the gravity of the situation sets in and the more headstrong try to deal with it as best they can. The art team does a great job creating a dark and terrifying environment too, and the fear is palpable. The double page splash in the middle in particular is gorgeous. I’m really interested to see how this series develops and what lies ahead for Karen, Adrian, Isaac, Ben and Calder as they venture into The Woods. I especially liked how the mysterious first page takes on an intriguing meaning as we approach the end of the issue. I’ll definitely be keeping up with this series, and I suggest you do too. Check it out at your local comic book shop or digitally. *It was a tough call to review this or the equally excellent ‘The Wake’ issue 8 from Scott Snyder, Sean Murphy , Matt Hollingsworth and Jared K. Fletcher (which you should also definitely buy). I ended up choosing The Woods because it is new, and I’m almost certainly going to do a full review of the whole of The Wake when it comes out in trade paperback.